NASA is gearing up for the planned Friday (Oct. 28) launch of its newest Earth-observing satellite, a trailblazing spacecraft that will be the first to make observations for both short-term weather forecasts and long-term climate monitoring. Appropriately enough, it looks like Mother Nature will cooperate. Current forecasts call for a zero percent chance of launch-violating bad weather. The National polar-orbiting operational environmental satellite system Preparatory Project — or NPP for short — is due to blast off from Vandenberg Air Force Base in California at 5:48 a.m. EDT (0948 GMT) Friday, aboard a Delta 2 rocket. Preparations for an on-schedule launch are coming along nicely, with the NPP team completing its launch readiness review today (Oct. 26), NASA officials said. So everything should go off as planned. "It's looking to be very favorable conditions for launch day," Lisa Cochran, launch weather officer at the 30th Operations Support Squadron at Vandenberg, told reporters during a briefing today. Once aloft, the minivan-size NPP will zip around Earth in a polar orbit, peering down at our planet from an altitude of 512 miles (824 kilometers). The $1.5 billion satellite will use its suite of five science instruments to make a variety of observations, which should be useful to weather forecasters and climate modelers alike, officials said. For example, NPP will record sea and land surface temperatures, track atmospheric ozone and dust levels, measure changes in vegetation productivity and monitor sea ice, land ice and glaciers around the world, among other things, researchers said. The result could be a better understanding of climate change and its impacts. "It's the prototype of the next-generation weather satellite," NPP project scientist Jim Gleason, of NASA's Goddard Space Flight Center in Greenbelt, Md., said in a recent NASA video. "It's the nation's first attempt to really combine weather monitoring and climate observing in the same platform." NPP was originally conceived as a demonstration mission for the National Polar-orbiting Operational Environmental Satellite System (NPOESS), a joint military-civilian project that would monitor both weather and climate. However, NPOESS was scuttled in 2010, doomed by a series of delays and rising cost estimates. 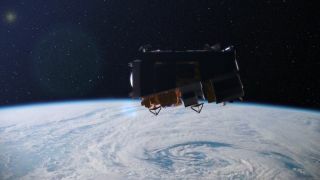 The military-civilian partnership was dissolved, with each branch directed to develop its own line of polar-orbiting Earth-observing satellites. NASA and the National Oceanic and Atmospheric Administration (NOAA) are working on the civilian program, which is called the Joint Polar Satellite System, or JPSS. While NPP will gather important data itself, the satellite is also viewed as a key step toward bringing JPSS online. For example, NPP will try out technology that could be incorporated into JPSS, researchers said. NPP is designed to be operational for at least five years, which should keep the satellite working until JPSS is ready to go. The first JPSS satellite is slated for launch in late 2016, officials said. NPP is not the only payload aboard the Delta 2. The rocket will also carry six cubesats — tiny satellites that measure about 4 inches (10 centimeters) across — into orbit. The cubesats were designed by university students and will ride to space as part of NASA's Educational Launch of Nanosatellites program.